Location of Cincinnati on a map. Cincinnati is a city found in Ohio, The United States Of America. It is located 39.16 latitude and -84.46 longitude and it is situated at elevation 192 meters above sea level. Cincinnati has a population of 296,943 making it the 3rd biggest city in Ohio. It operates on the EDT time zone, which means that it follows the same time zone as Columbus. 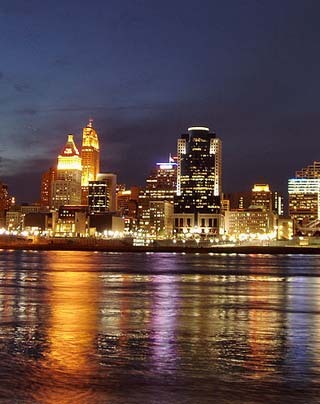 Located directly across the Ohio River from Covington, Kentucky, Cincinnati is one of the State of Ohio's larger cities along with Columbus and Cleveland. One of America's early boomtowns, Cincinnati expanded rapidly in the early 19th century to become the first major inland city in the country. Today, as then, it's renowned for its hard-working, public spirited citizens. This is a city of dedicated sports fans (some say fanatics), as baseball's Cincinnati Reds and football's Cincinnati Bengals are hometown teams. Other major attractions for locals and visitors include the Cincinnati Tennis Masters, the city's annual flower show, and its German-oriented Oktoberfest, the largest one in North America. Cincinnati houses one of the largest collections of nineteenth-century German architecture in the U.S. Baseball's Cincinnati Reds, the hometown team, was named for America's first professional baseball team, the Cincinnati Red Stockings. Steven Spielberg, the world famous film director, was born in Cincinnati. Welcome to the most visited seasonal theme park in the U.S.! The Midwest's largest amusement park, Paramount's Kings Island, is home to over 80 rides, shows and attractions, including 15 thrilling roller coasters. Experience Tame the Beast, one of the longest wooden coasters in the world, admire the amazing 1/3 scale replica of the Eiffel Tower; enjoy a splash in Boomerang Bay, a family water park featuring several slides and a wave pool or join the live entertainment shows for added fun! A top attraction in Cincinnati, the Zoo and Botanical Garden is more than 125 years old. One of the oldest and best in North America, it attracts more than a million visitors each year. Discover fabulous plant species (more than 3,000 of them) and learn about the 500 animals from the various continents of the world that live here. The stars of the Cincinnati Zoo and Botanical Garden include the exotic collections of felines, featuring the magnificent white lions, the Sumatran rhino exhibit, the superb botanical garden and the creatures of the evening in the Nocturnal House. Located in Union Terminal and built in 1931, the Cincinnati Museum Center at Union Station was has been restored to its Art Deco splendor. Home to a number of museums, the Museum Center is a Cincinnati vacation must for the whole family. The Cincinnati Historical Society Museum has one of the largest regional collections in the U.S., while the Cinergy Children's Museum is home to nine interactive exhibits, including Kids at Work, Energy Zone and Waterworks. Cincinnati has a population of around 297397, of which 141208 (47%) are male and 156189 (52%) are female. The average age of the inhabitants of Cincinnati is 35.66, meaning that the average person is below the national median age of 37. For every male, there are approximately 1.11 females, meaning that the population is relatively evenly distributed between males and female(s). Of Cincinnati's 297397 residents, around 288932 (97.20%) identify as having a single race. The majority of the population is white, which consists of 51.10% of the population. Of the remaining population, 127358 are black/African Americans (42.80%), 695 are native Americans (0.20%), 5901 are asians (2.00%), 108 are pacific islanders (0.00%), 2821 are other (0.90%). The median income of households in Cincinnati is $33604.00, meaning that most of the households are above the poverty threshold for families of three. Of the total population, 17.70% of households reported an annual income of less than $10,000. The city of Cincinnati has 32 zipcodes recognized by the United States Census Bureau: 45202, 45203, 45204, 45205, 45206, 45207, 45208, 45209, 45211, 45212, 45213, 45214, 45215, 45216, 45217, 45219, 45220, 45223, 45224, 45225, 45226, 45227, 45229, 45230, 45231, 45232, 45233, 45237, 45238, 45239, 45243, 45248.